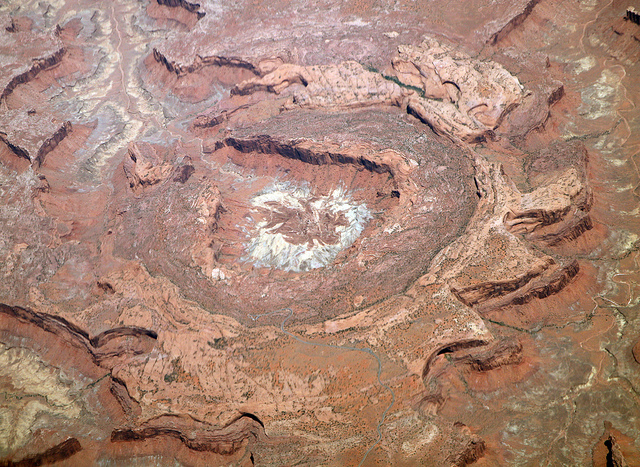 Canyonlands is a place of relative geologic order. Layers of sedimentary deposits systematically record chapters in the park's past. With some exceptions, these layers have not been altered, tilted or folded significantly in the millions of years since they were laid down by ancient seas rivers or winds. Upheaval Dome is quite a different story. In an area approximately three miles (5km) across, rock layers are dramatically deformed. In the center, the rocks are pushed up into a circular structure called a dome, or an anticline. Surrounding this dome is a downwarp in the rock layers called a syncline. What caused these folds at Upheaval Dome? Before 2008, Geologists didn't not know for sure, and there were two main theories which were hotly debated. In 2008, "shocked quartz" was discovered. This was the critical clue that solved the mystery. Upheaval dome was actually created by a meteor collision. When meteorites collide with the earth, they leave impact craters like the well-known one in Arizona. Some geologists estimate that roughly 60 million years ago, a meteorite with a diameter of approximately one-third of a mile hit at what is now the Upheaval Dome. The impact created a large explosion, sending dust and debris high into the atmosphere. The impact initially created an unstable crater that partially collapsed. As the area around Upheaval Dome reached an equilibrium, the rocks underground heaved upward to fill the void left by the impact. Erosion since the impact has washed away any meteorite debris, and now provides a glimpse into the interior of the impact crater, exposing rock layers once buried thousands of feet underground. A thick layer of salt, formed by the evaporation of ancient landlocked seas, underlies much of southeastern Utah and Canyonlands National Park. When under pressure from thousands of feet of overlying rock, the salt can flow plastically, like ice moving at the bottom of a glacier. In addition, salt is less dense than sandstone. As a result, over millions of years salt can flow up through rock layers as a "salt bubble", rising to the surface and creating salt domes that deform the surrounding rock. When geologists first suggested that Upheaval Dome was the result of a salt dome, they believed the landform resulted from erosion of the rock layers above the dome itself. Research suggested that a salt bubble, as well as the overlying rock, had been entirely removed by erosion and the present surface of Upheaval Dome was the pinched-off stem below the missing bubble. If this theory had been true, Upheaval Dome would have had the distinction of being the most deeply eroded salt structure on earth.